I can't believe how fortunate we are! Leslie Kill, who was featured just yesterday, has offered to give away one of her fabulous Mended Hearts to a lucky reader! That's it, right up there at the top. I'm only sorry that you won't receive it in time for Valentine's Day, but heck, there's no wrong time to receive a Mended Heart, right? 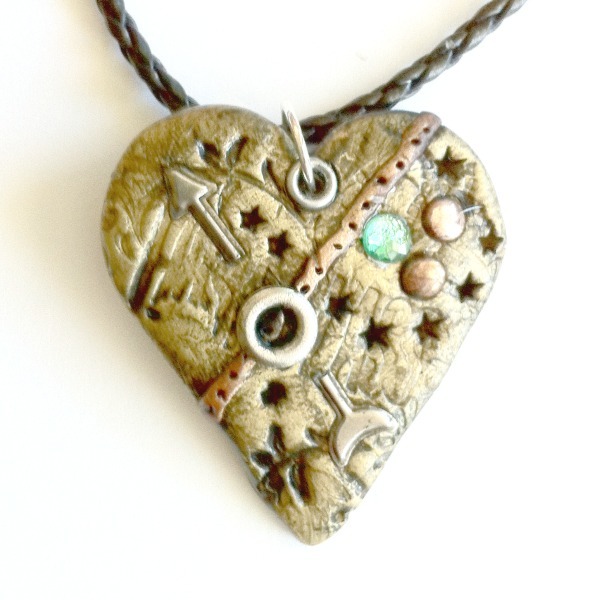 Would you like to win this beautiful Mended Heart? Just leave a comment below to tell Leslie and me what Valentine's Day means to you, and you'll automatically be entered to win. If you tweet or post on Facebook or other social spots about the contest, you can leave a second comment and be entered twice! Valentine's Day means that the Lover of My Soul has rescued me ! Valentine's Day, for me, means remembering to appreciate my honey. And, maybe wear a heart necklace or pin. Valentine's Day is a time where I am reminded just how lucky I am to be married to a great guy who supports me fully and stands beside me during thick and thin. Love is an every day emotion. As evidenced by " I love the mended heart." Valentines day is special to me because I gave birth to my son on Valentines day, and because I have a husband that always goes out of his way to make Valentines day special for me, he is very romantic! It means spending valuable time with those I love. Valentines day is like Christmas around our home.. we have it everyday! Pretty cool mended heart, my hubby just had valve repair surgery and is still in rehab hospital.. where he also spent our wedding anniversary last year..
Valentine's Day is a day to slow down and remember all of those you love. Not just your SO, but everyone who has touched your heart in some way. I love Valentine's for so many reasons... even had my oldest son baptized on Feb. 14... many years ago! I especially love the theme of a heart being "mended", as there are precious few of us who carry a heart that HASN'T been in need of repair at least a few times! Thanks for highlighting Leslie's work, Cindy! Valentine's Day is a special day to show those close to you how special they are and how much they are loved. It can be done with words, a homemade card, a special meal...It's a day to celebrate love!! I feel like EVERY day is Valentines Day! I have a wunerful hubby and sooo many loveley people in my life! I am truly blessed! Pretty please count me in for this fab giveaway! Thanks! My mother just passed away, Feb 9, and my heart is broken right now. I would love to have it! I try to let my husband know how much he means to me everyday so Valentine's Day is when I let everyone else know how just how special he is. Valentine's Day means to me chocolate without guilt! No matter what age you are always young at heart on Valentine's Day.